Capitalism, I’ve often argued, is not natural. It requires a lot of work. It required a lot of work to get it going in the first place. And it requires a lot of work to keep it going today. A lot of that work involves getting people to work for someone else. The problem of getting people to work is the foundation of the recent discussion (or, better, revival of the discussion, if we trace it back to Alvin Hansen) of “secular stagnation” [pdf]. 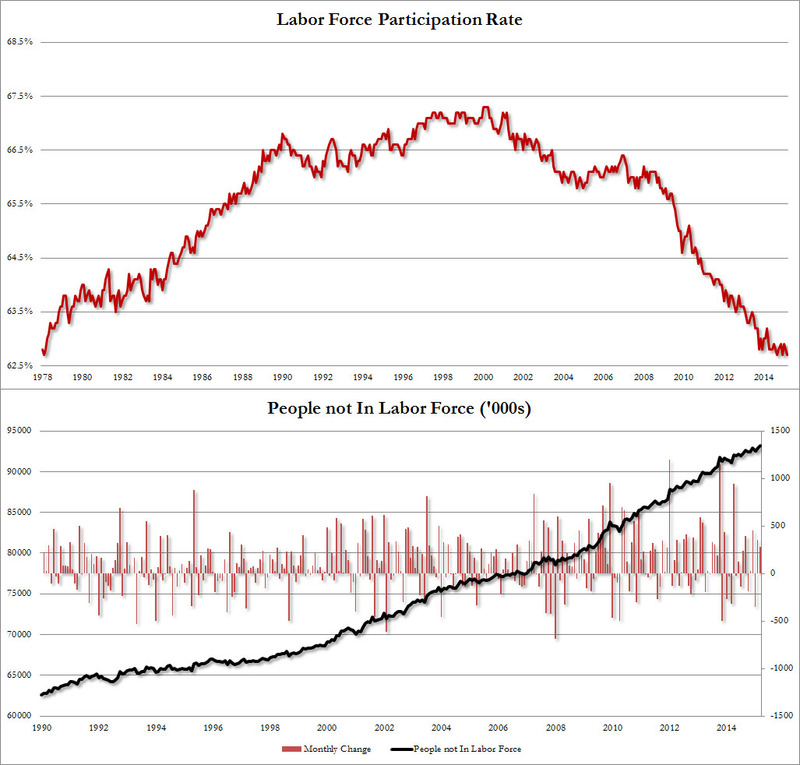 Central to the current framing of the question—at least among mainstream economists—is the decrease in the number of available workers, created by declines in the rate of population growth and the labor force participation rate. The worry is that, looking forward, there simply won’t be enough workers to sustain the rates of potential economic growth we saw in the years leading up to the most recent crisis of capitalism. It shouldn’t be surprising, then, to witness the spectacle of economists such as Regis Barnichon and Andrew Figura [pdf] claiming that the decline in the labor force participation rate in the United States is “a decline in desire to work among individuals outside the labor force, with a particularly strong decline during the second half of the 90s.” For them, it’s not a decline in the number of decent, high-paying jobs, but instead the unwillingness on the part of individuals who are currently not counted as part of the labor force to enter the labor force in order to work for someone else. And the reason? Looking across different sub-groups, the decline in the number of nonparticipants who want to work is due mainly to prime-age females, and, to a lesser extent, young individuals. Moreover, the decline is mainly a low-income and non-single household phenomenon, and is stronger for families with children than without. But if poor people are still unwilling to take one of the low-wage, deadend jobs available, there’s always the stick of Kansas-style welfare reforms. All of that, both theoretically and in terms of policy, is meant to force people to have the freedom to participate in the labor force. But that still doesn’t mean they’re going to do the requisite amount of work, even after they’ve landed one of those jobs. According to Ronald Aslop [ht: ja], the problem is particularly acute among young people, who in his view are engaged in a constant struggle to keep their minds focused on the matter at hand and block out email and other digital distractions. These distractions are shortening attention spans and making it difficult for young people to concentrate and stick with demanding assignments at school and work. In fact, researchers have found that millennials are more likely than Gen Xers or baby boomers to report that their productivity suffers at work because of smartphone distractions and “cyberslacking” on the Internet. That means employers have to step in “to eliminate some of technology’s temptations” (which apparently involves limiting the use of digital technology and, my favorite, suggesting that distracted employees learn meditation and yoga). What we’re learning is that it takes a lot of work to keep capitalism going. But notice that all that effort is directed at the masses of people who actually do the work, not at the tiny minority at the top who actually make the decisions about if, when, and how the jobs people are expected to do are actually created. Apparently, focusing on those decisions—especially as corporate profits soar and economic inequality continues to grow—would require too much work.